I’ve been asked by one of my lovely blog friends for a list of books that I’ve read (and recommend) so far this year. Well, I aim to please – so here’s ten of my favorite reads of 2012. I’m sure this list will continue to expand and grow with all the terrific books coming out the second half of the year. I’ll admit to being hesitant at first, since I’m not normally a fan of high fantasy – but this book took me by surprise in the best way. I LOVED it. This was a fun, fast paced thriller and I can’t recommend it enough. I definitely didn’t see this ending coming, and I’d reread it again in a heartbeat. I know I raved about WITHER in my best books of 2011 and FEVER did not disappoint. It’s amazing. And I’m not just saying that because she’s my agent sister. I can’t WAIT to get my grubby little hands on SEVER, the final book in the Chemical Garden Trilogy. HIGHLY RECOMMEND. Again, this was something I was worried might not be my thing – but I was WRONG, WRONG, WRONG. I devoured it in one sitting and am anxiously awaiting the next book. Get yourself a copy of this and be amazed by the excellently told story of Cinder. Oh my gosh, where to start? I could gush forever and a day about how much I loved this book. It might be one of my ALL-TIME favorites. Just sayin’. I started with the first book (WAKE) and immediately bought the second two (FADE and GONE). This is a fast read filled with lots of twists and memorable characters. I just finished this book two days ago and I love it. The ending will make you scream for book three. Thank goodness there’s a continuation because I’m not ready to let go of these characters just yet. If you haven’t read the first book HOURGLASS, do so immediately!!! I was skeptical that this might be too slow (or too fast) paced because it takes place over 24 hours, but (once again) I was dead wrong. This was definitely a fun read. I can’t even begin to describe how awesome this was, if you haven’t gotten a copy yet – drop everything you’re doing and run to your local bookstore. Lissa is another one of my agent sisters, but I’d devour it even if she wasn’t. (What can I say? My agent has fabulous taste :)) If you liked the HUNGER GAMES, you’ll love it. SO GOOD. This is a book GoodReads recommended I try and I’m super glad I did. It’s one of the best mythology retellings I’ve read. It’s fresh and clever and I could go one for days. LOVED IT. That was hard picking just ten! There are soooooo many other great books I’ve read recently. 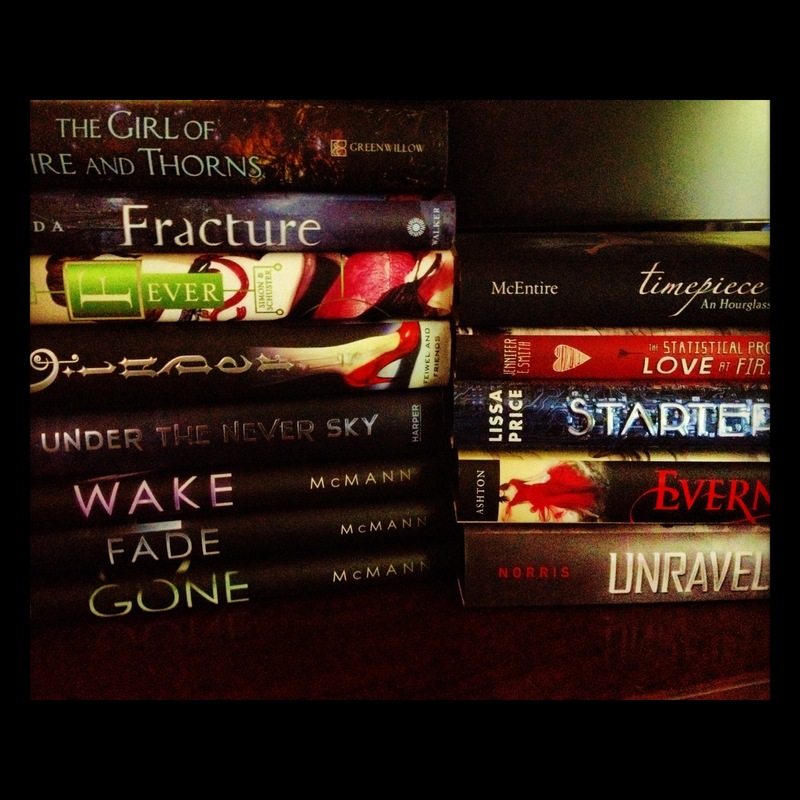 (One of them being UNRAVELING by Elizabeth Norris, and INSURGENT by Veronica Roth.) If you’d like to see what else I’ve been reading (and suggest your favorite reads to me) friend me on GoodReads by clicking here.